How Can We Make Charitable Giving A Year-Round Habit? I was listening to a story on Marketplace on NPR this afternoon with Tess Vigeland and Chris Farrell who reviewed their 2008 financial goals and graded themselves on their accomplishments. Chris Farrell set a 2008 goal to make his charitable giving a monthly activity, not a mad rush in December. He confessed that didn't meet the monthly goal, although he did a lot of research and giving in December. Given the economy and its impact on nonprofits and fundraising, it got me thinking that making charitable giving a habit beyond the holidays is a good thing. Certainly, giving from individuals won't be enough to fix the economy and provide the resources that charities need to deliver important services in hard economic times. But donating money to a charity, even a small amount (or in-kind items) can certainly help with part of the need and raise awareness in others. And while for some giving regularly is a matter of time and attention and for others it may be a limited budget and giving in micro-donations, cash gifts of very small amounts made with one or two mouse clicks like the Salvation Army's Red Kettle Campaign or the Wellwishes Campaign. It won't be easy, but it's worth setting a goal of everyday or at least every month giving in small amounts to charities. 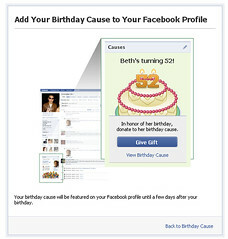 Here's a few ideas to help make charitable giving get on your calendar each month for 2009. January: Have a January birthday? Ask people to donate to a cause instead of gifts. Last year, when I turned 51, I posted a challenge on my blog - could I get 51 people to donate $10 to the Sharing Foundation? And, yes they did! But it doesn' t always have to be you asking people to donate. For my 50th birthday, I held a 50th Birthday Card Photo Remix Contest on flickr and donated $50 the winner's favorite charity. February: So, maybe your true love is trying to work off those extra pounds holiday pounds and really wouldn't appreciate the chocolate. What about a gift in their honor to celebrate the special day. Dr. Mani holds an annual Heart Kids Blogathon on Valentine's Day to raise money for heart surgeries for poor kids from rural India. The American Heart Association also does a Valentine's Day campaign. March: March is beginning of the spring and spending more time outdoors. Is someone you know training to run a marathon for charity? Or, maybe you're trying to get in shape and training for a marathon or cycling event. Check out Train for Humanity that weaves together getting fit, social media, and raising funds for charity. April: We celebrate Earth Day this month. So, what better way to love the earth than contributing to a charity that works on environmental issues. An easy way to support the Nature Conservancy if you're on Facebook is to install (Lil) Green Patch. You don't need to open your wallet because each install generates a small amount of revenue to Save the Rain Forest. Or support an organization that does recycling. One of my favorites is the computer recycling group, FreeGeek. May: When I think of May, I think of Mother's Day. Why not donate to a Women's Shelter in honor of your mom? Gradon Tripp, Boston Blogger, created a fundraiser to support Jane Doe Inc. in honor of his late mother. There was so much support for the idea, that he started an entire fundraising organization fueled by social media to support Jane Doe. If you're a blogger, you can run a comment for a donation contest. For example, Mizfit is donated a dime per comment to a local women's shelter. Several of her regular readers including Deb Roby have pledged to match her donations to their favorite charity. Another option, is to sponsor a woman who wants to make a better life some place in the world. Britt Bravo recommends Women for Women International. June: In the US, June is the time for graduation or when school is out. But in many places around the world, children can't attend school because there isn't a school building, teachers, or supplies. Why not give a small donation to help a school in Africa, like Epic Change's projects or find a project in a corner of the world that is meaningful to you. July: Ah, those summer months when we spend hours outside in the sun and fun. But for many individuals seeking optimal health this isn't possible. So, why not consider a micro loan to lend4health that facilitates loans to individuals with autism spectrum disorders so they seek treatment. Or sometimes the problem is that there isn't a safe playspace in a community. Organizations like Kaboom help build them. August: It's the dog days of summer. So, why not give a little something to an organizaiton that supports dogs (and cats), like Best Friends. It's also one of the worse months for hurricanes and the Red Cross has made it easy to give a donation with your cell phone through its text 2 give program. September: Food and water are basic human needs. September is Hunger Awareness Month so why not give a donation of canned goods and cash to your local food bank? Or, consider making a contribution to an organization like Share Our Strength that is working to end childhood hunger. CharityWater which builds wells for clean drinking water around the world organizes a September birthday campaign. October: By October, school is in full swing. That's when DonorsChoose launches its bloggers campaign, where bloggers around the world help raise money to support the needs of a classroom in a needy school. October is also breast cancer awareness month, so why not make a donation? November: This months heralds the start of the holiday giving season and there will be many opportunities for you to make a donation. One of my favorite organizations, Creative Commons, launches its very creative fundraising campaign during November. You can find your favorite charity or discover a new one on one of the giving sites like Network for Good or Razoo. December: This is the time to give to your favorite charities - whether organizations that provide services to the homeless or toys for needy children or to support a fundraising drive by a friend. It's your choice. Britt Bravo has some advice about doing your due diligence in creating a giving plan for holidays that can work for creating an annual giving plan as does the Razoo blog. How can you make your holiday charitable giving a year-round habit? What charities will you be contributing beyond the holiday season in 2009 and why? Here's to many wonderful causes benefiting next year, from many people. Hey Beth, this is a great discussion to get started and hopefully, this can become a hub for it to continue. I set up a fund drive in my dad's memory late (very late) to help a family at Christmas. I set it up through fundable.com on December 13 and promptly started talking it up through Twitter and Facebook. Within a week, I had raised $2,500+ and was able to do more than change Christmas for a family of 7 here in VA. We also gave them a $500 gift card for groceries and placed a $600 credit on their electric bill through a contact at Social Services. 2) The response I've gotten has inspired me to look for a way to keep this going - still in memory of my dad - year round and look for ways to help more families in rural southwest VA. Ultimately, I'd like to offer scholarships to the kids in the families we help if they pursue college or a trade school after high school. This is a great topic and one that is perfectly timed now that we're all sitting back feeling good about what we did this year. The question to everyone is, can we all keep our foot on the gas and continue to work toward improving the lives of others? Hi Beth. "How Can We Make Charitable Giving A Year-Round Habit?" Great question! We'd love to tap into the energy and value of trusted, local WOM referrals to benefit charitable orgs. Our community platform is in limited release - just greater-Hartford, CT. I'll keep you posted as things progress. It will certainly be a way to benefit one's favorite charity by just doing what consumers do - sharing about the local businesses they trust. BTW - thanks for the referral to Christine at Social Actions. Bright folks with a very neat service. We had an excellent talk. Coordinate a New Year's resolution with monthly donations. For ex, if you're trying to kick your caffeine habit or cut it in half, calculate the money you would have spent on the java and donate it to your charity of choice. This 'budget' doesn't really seem to be targeted to non-profits. It seems more like it's advice for regular people. I'd be more interested in knowing which non-profits will be getting more traction and better dollar-efficiency in the down market. A list would be interesting. THAT is who I want to give to. Thanks for this post Beth. One of my goals for 09 is to give monthly to one international and one domestic charity. I know I want to do kiva.org for international, and you've given me some great ideas for giving domestically. Thanks for always reminding us how easy it really is to give back. I love the idea of considering the needs of a particular season when making contributions, it's a great way to engage in several worthy causes and establish some consistency. I've actually found it helpful to set up automated giving to put the majority of my philanthropic activity on auto-pilot -- that way most of my donations are allocated evenly throughout the year. Most banks make it easy to do this and you can use sites like ours (Razoo.com) if you want to use a credit card. Great suggestions! One more, give a scholarship per month, one student per month in 2009! www.buzzfund.com changing the way Students pay for college! As a small but vital Mentoring Program: www.sonomamentoring.org, we need the help of our neighbors! So as you look for places to help in 09 remember to keep your own community close at heart! Planning ahead for charitable giving takes some of the emotion out of it, in a good way. Instead of giving impulsively to the one with the most effective sales pitch, budgeting means giving to those whom we really want to support.